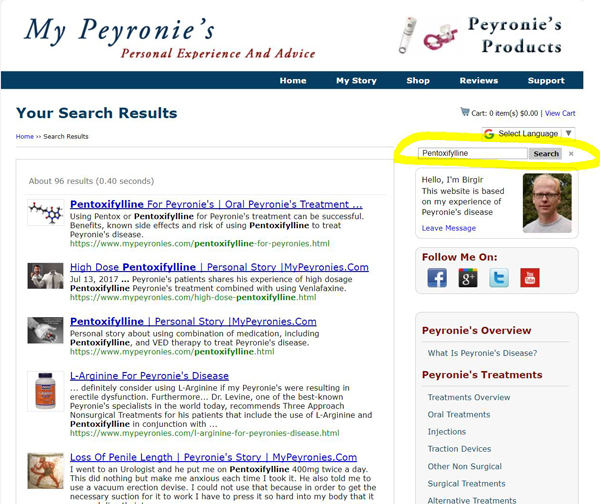 Since My Peyronie’s was founded I have received thousands of e-mails. I have tried to answer everyone as quickly and thoroughly as I can. However, the volume of e-mails I receive has now reached the point that I simply cannot cope anymore with replying to all of them. My Peyronie’s is not a sponsored website so I’m replying to e-mails in my spare time. I therefore have to introduce some changes. All purchase related enquires will be answered and follow up questions from people that have bought through my website. But for other enquries the below guideline applies. Many of the e-mails I receive are asking questions about topics that I have already covered on this website. I will not be replying to these e-mails anymore as you can find the answers you need by searching my website and then reading the information you find. So how do you find what you are looking for? Let’s say you are interested in trying Pentoxifylline treatment. Just type the word Pentoxifylline in the search box in the top corner on the right-hand side (shown highlighted in yellow in below photo) and press enter. This brings up all articles on my website where Pentoxifylline is mentioned, with the most relevant articles at the top. Reading those articles and the links included in them should answer most questions you have on the subject. However, if you still have questions that I may be able to assist you with (please bear in mind that I’m not a medical doctor as clearly stated on my website) then you can contact me with specific questions and I will do my best to assist you (see later what kind of questions I will answer). If you think you may have Peyronie’s disease or if you have just been diagnosed with Peyronie’s these are the articles (article sections) that I recommend you start by reading. Again, if you have any specific questions once you have read them feel free to contact me but I will only answer questions that have not already been answered in below articles. 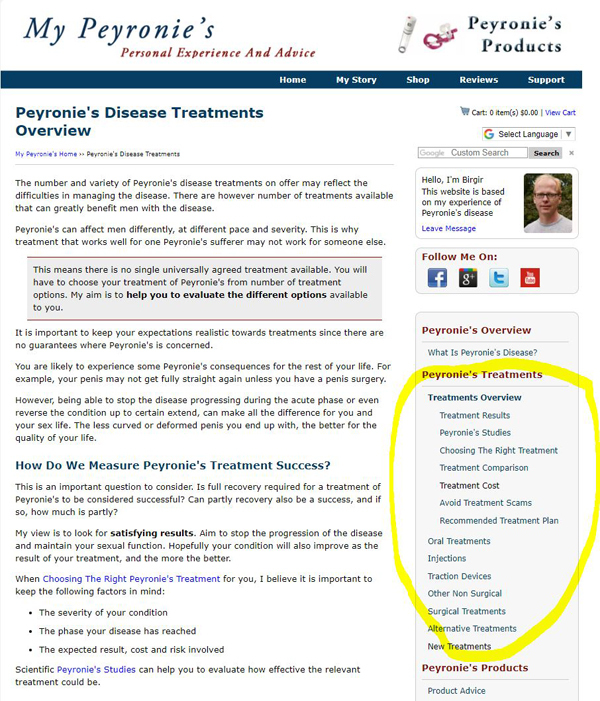 If you are interested in a specific treatment option, then you should look under Peyronie’s Treatments (highlighted in yellow below). If you cannot find anything about the treatment you were looking for then I have not covered / researched it yet and therefore cannot answer your questions about it. I’m not adding more treatment options unless I have seen satisfying scientific support for them. If you are in a relationship or if you are concerned about how Peyronie’s may affect your future relationships then those articles can hopefully help. Still Can’t Find The Answer You Were Looking For? If you have searched and read everything on my website about the topic and still have not found an answer to your question then you can contact me through the contact form at the end of this article. How long have you had Peyronie’s? What is your current condition (curvature, pain, erectile dysfunction, etc)? Have you seen a doctor and if so what did he say? Have you had a treatment and then which treatment and what is the outcome to date? Then please ask a specific question. If you have more than one question, please number them as done above. If I feel I can answer your question and / or offer you some advice I will do so by e-mail. But I will also publish the question and my answer under Your Peyronie's Questions as it may benefit others in the future. I will of course publish all questions anonymously. All purchase related enquires will be answered and follow up questions from men that have bought through my website. I’m very sorry that I can no longer reply to every e-mail I receive but I have provided lot of free content that will hopefully help you to find the answers you are looking for. And if you don’t, you can still contact me. But this way I can concentrate better on the questions I do answer and by publishing my replies they will become available to other men seeking answers in the future. I wish you all the best and good luck with your treatment if you are having any. PLEASE MAKE SURE YOU HAVE READ ABOVE DIRECTIONS CAREFULLY BEFORE FILLING OUT THE FORM AS ONLY QUESTIONS FULLFILLING THE ABOVE CRITERIA WILL BE ANSWERED. All purchase related enquires will be answered and follow up questions from men that have bought through my website (please include your purchase number in your enquire).